Fall 2018 CIT participants included: Front row, from left, Sgt. Dan Crites and Sgt. Mark Denning with the Defiance County Sheriff’s Department, and Patrolmen Stormy Doctor and John Williamson III with the Defiance Police Department. 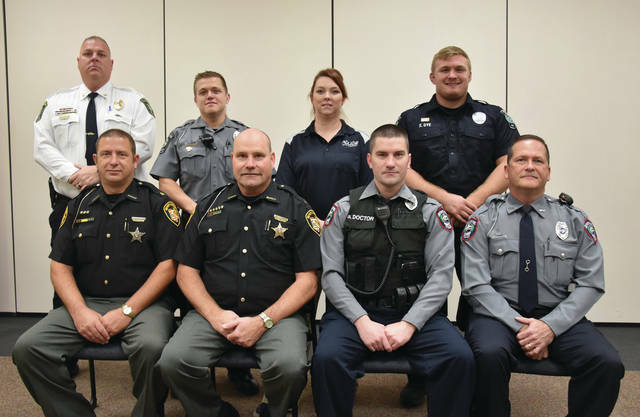 Back row, from left are Napoleon Police Chief Dave Mack, CIT instructor; Patrolman Joseph Gill with the Swanton Police Department; and Patrolmen Xavier Dye and Tera Rogers with the Archbold Police Department. Also participating in the CIT training, but not pictured are Northwest Ohio Juvenile Detention Center superintendent Dennis Greer and Michelle Jacobs with the Williams County Sheriff’s Department. Nineteen law enforcement officers from nine different departments recently graduated from the fall Crisis Intervention Team (CIT) training, sponsored by the Four County ADAMhs Board and NAMI Four County. This was the 10th training that the ADAMhs Board has coordinated in the last seven years. A total of 152 law enforcement officers from area police and sheriff departments as well as probation and corrections officers have been trained in techniques that have been proven effective for de-escalating crisis situations involving mentally ill persons. During the week-long training, a variety of mental health topics are presented to help participants recognize when they are dealing with a situation that may involve someone with a mental illness and understand how mental illnesses are treated as well as the types of medications that may be prescribed. Drena Teague with the Four County ADAMhs Board has coordinated all of the CIT trainings. However, this was the last training that she will coordinate since she is retiring later this month. Teague said a lot of time is spent explaining and demonstrating how someone with a mental illness behaves when they are experiencing a mental health crisis. The instructors’ presentations are supported by panels of family members and persons with a mental illness who explain how they act and respond to others when they aren’t doing well. The panelists also explain how they would like to be treated and interact with others, including law enforcement. During the week, participants learn that the assertive skills and approaches that police officers have been trained to use in a crisis will often make a crisis involving a mentally ill person worse. Instructors for the training included Napoleon Police Chief Dave Mack; Leslie VanAusdale, CCNO training supervisor; Brenda Byers and Tyler Bishop with Recovery Services of Northwest Ohio; and Jamie Mendez with the Napoleon Police Department. The CIT program was developed a number of years ago by the NAMI affiliate in Memphis, Tenn. and the Memphis Police Department following an incident involving a mentally ill person that ended tragically. Today, the program is widely used to teach police how to safely and humanely handle calls that involve someone who is mentally ill.
With more than 150 law enforcement officers now trained in CIT in Defiance, Fulton, Henry and Williams counties, family members or friends of a loved one with a mental illness are encouraged to tell the police when they need help if the situation involves someone with a mental illness and to request a CIT-trained officer if the department has one on duty.